The Noguchi Museum, in an austere building softened by vines, gives little hint of the beauty within, and the range of experience that awaits visitors. The space changes as you go, starting with the area that had once upon a time been a gas station and its roughness remains. The setting changes rough floors to polished wood as you walk through the exhibits. Some areas are open to the outside, others are fully enclosed. Then, there's the spacious garden area which forms the outdoor backdrop for more of his work. Although the Museum opened in 1985, it reopened in June 2004 after renovation with a new cafe, shop, heating and cooling system that enabled the Museum to be open all year. The museum has family workshops and programs, music in the garden during the summer, and curators talks. 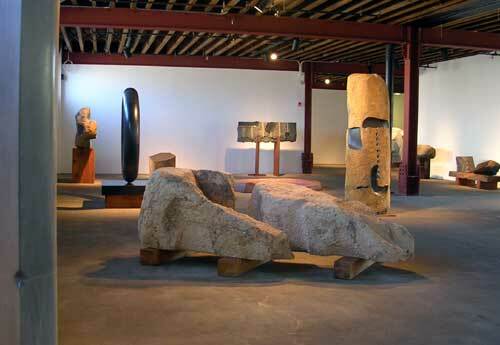 There's a nicely done video on Noguchi's history and influences. Plus gallery talks every day at 2 PM. The gallery talk I attended was excellent with the educator asking questions to bring us into the process. What do you see? What choices did Noguchi seem to make? Whas does it remind you of? And soon we're all calling out our thoughts. 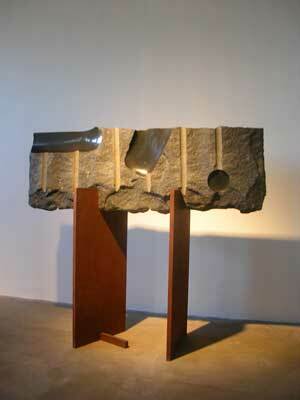 Noguchi was a process-oriented artist. He followed the stone, the colors, textures, shapes that he saw within. As a result his work has an organic quality that mixes rough textures, stippling, grooves and planes, with highly polished areas. Even the sleek and highly worked pieces seem deeply rooted in the characteristics of the stone. Eternal images and materials. However, there is a risk to reading too much into the meaning of his pieces. Naguchi titled much of his work just to please gallery owners. He himself was more interested in bringing out the qualities of the material. As an example there are two pieces that were originally created to be interesting walls, used to separate areas in a gallery. These had an abstract, highly worked quality that would normally be associated with the intention to create art, not walls, clearly making the point that sometimes we put more into a piece than the artist intended. Although the renovated Museum has a fresh look, great care has been taken to maintiain the original character of the building, which was integral to Noguchi's vision for the Museum.